1. This sheer floral moment with rows of pom-poms to spare. Get it from Amazon for $20.99+ (available in sizes XS-L). 2. An edgy dress that's a lil' mesh, a lil' tee, and a whole lotta rock 'n' roll. Get it from ASOS for $37 (available in sizes XS-XL). 3. A playful dress that's a party in the front and back. Get it from Amazon for $9.99+ (available in sizes S-L, four colors). 4. A two-way cape dress befitting a telephone booth transformation. Get it from Front Row Shop for $26.80 (available in sizes S-L). 5. A spellbinding bodycon dress with a whole lotta look...but you can totally handle it. Get it from Boohoo for $40 (available in sizes 4-10, two colors). 6. An I-just-threw-this-on with volume that won't weigh down your OOTD. Get it from Express for $35.94 (available in sizes XS-XL, two colors). 7. A memorable formal stunner to turn you into a chic ¯\_(ツ)_/¯. 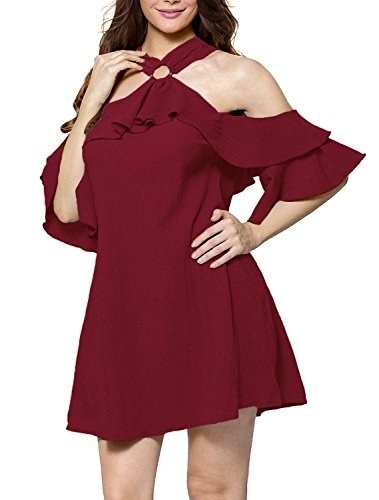 Get it from Amazon for $49.95 (available in sizes XS-3X, eight colors). 8. This low-key frock that'll make you pause like this to consider, like, everything. Get it from ASOS for $51 (available in sizes 2-14 and plus 12-28). 9. 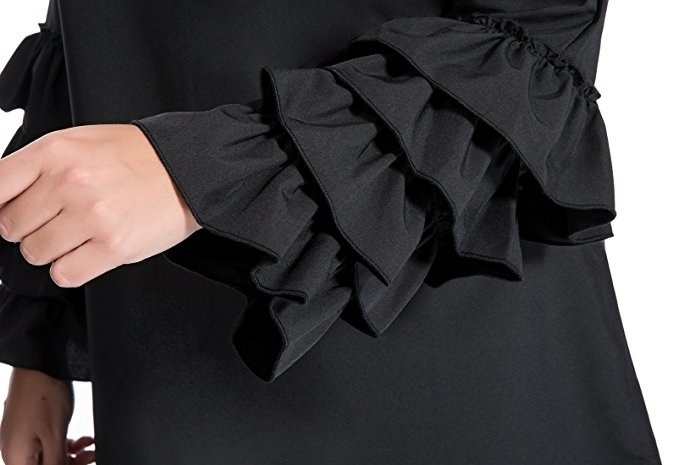 A silky cold shoulder worthy of some good side eye. Get it from Missguided for $48 (available in sizes 0-12). 10. A bow-tie affair that's pretty casual IRL. Get it from Urban Outfitters for $59 (available in sizes XS-L). 11. A chambray number with enough fabric in each sleeve to make another dress. 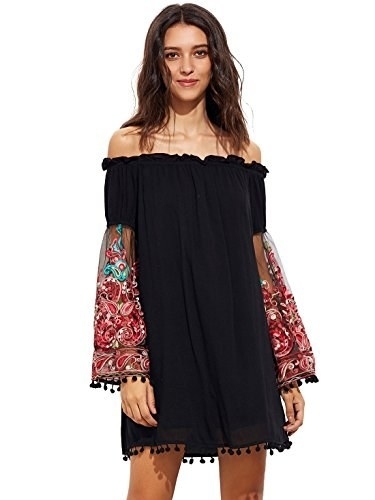 Get it from Forever21 for $58 (sizes S-L). 12. 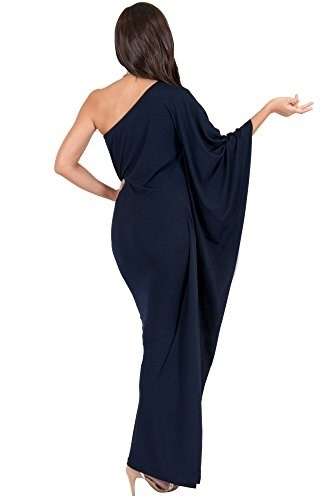 This extra-AF dress for sweeping onlookers off their feet. Get it from Missguided for $56 (available in sizes 0-10, three colors). 13. A Super Woman-esque number that (wisely) puts all its eggs in one sleeve basket. Get it from Nasty Gal for $50 (available in sizes 2-10, two colors). 14. A voluminous stunner we'd recommend not wearing around bulls. Just sayin'. Get it from Tobi for $170 (available in sizes 4-6). 15. A pocketed dress that'll basically be your wing woman when it comes to keeping up with your stuff. 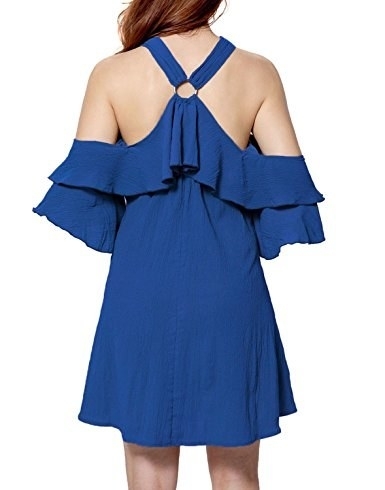 Get it from Boohoo for $36 (available in sizes 12-20, seven colors). 16. An LBD for when you can't be tied down. Get it from Nasty Gal for $20 (available in sizes 6-10). 17. An '80s-style statement shoulder made for coy looks. Get it from Urban Outfitters for $59 (available in sizes XS-XL). 18. Some barely there arm cover that -- lbh -- barely counts as sleeves but we're giving them a pass this time around. Get it from Urban Outfitters for $180 (available in sizes S-L). 19. A sparkly sweater dress you can sport on summer days when it's unseasonably cool. Get it from Nasty Gal for $40 (sizes 4-10). 20. A solid-color shift for reaching mariachi-band levels of sleeve greatness. Get it from Amazon for $19.99+ (available in sizes S-2XL, two colors). 21. And an embellished frock worthy of Queen Bey. Get it from Missguided for $320 (available in sizes 0-6, 10).